Emelios and Abigail are great!!! 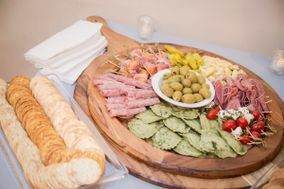 Emelios was a perfect caterer! They took care of everything and made sure my tables looked BEAUTIFUL!!! The food was amazing ( everyone raved over their vegetable lasagna. SO good!). Abigail is amazing to work with and made me feel so comfortable and confident about my reception. They really went above and beyond to make my night perfect!!! Bonus, at the end of the evening my venue owner said how wonderful Emelios staff was and how well they worked together. Thank you Emelios staff and Abigail for making everything so beautiful and stress free for me! We loved you guys!!! Sarah, thank you so so much for the great feedback. We had such a great time working with you, Chad, the venue and Beth! Thanks again for letting us be apart of your big day. Emelios was superb from start to finish. Starting with sampling the menu and providing not only a taste of the quality of food but of their professionalism and care they took with making sure Both Bride and Groom felt at ease; they also provided communication throughout the process and the pleasantness and ease of that communication made this wedding experience top notch ( we’ve dealt with other “professionals” in this area and believe me when I say this can sour your wedding experience). They Were extremely attentive throughout the entire reception with precision and intuitiveness. Everything was delicious and guests were impressed with the food. The prime rib literally melts in your mouth and the shrimp so big you had to cut them with a knife!! Lol. Emelios was superb from start to finish. Starting with sampling the menu and providing not only a taste of the quality of food but of their professionalism and care they took with making sure Both Bride and Groom felt at ease; they also provided communication throughout the process and the pleasantness and ease of that communication made this wedding experience top notch ( we’ve dealt with other “professionals” in this area and believe me when I say this can sour your wedding experience). They Were extremely attentive throughout the entire reception with precision and intuitiveness. Everything was delicious and guests were impressed with the food. The prime rib literally melts in your mouth and the shrimp so big you had to cut them with a knife! Lol. Thanks to emelios catering our wedding day was absolutely amazing! From the food itself, the display, and the professionalism of the staff we could not have had a better experience. They truly care about their customers! Annette and Abi were wonderful to work with throughout the whole process! The presentation day of was gorgeous, the food lines moved fluidly, and we barely noticed them working away diligently. They have a great team and they all work well together. 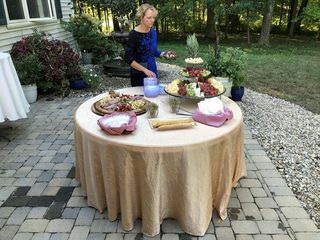 Most importantly, our wedding guests raved about the food, especially the meatballs! Emelio’s Catering is amazing! Staff is super friendly and helpful! The food is absolutely delicious! Annette, Abby and the Emelios team did a fabulous job at our daughters wedding! The food was delicious and the display breathtaking. The meal was served family style and the service was perfect! 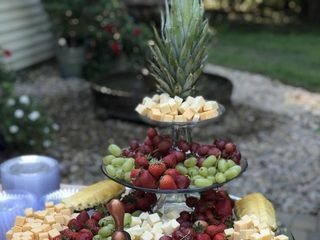 Emelios has catered two wonderful weddings and two grad parties for our family and we look forward to planning future events! Thank you! Annette was so wonderful to work with she took the time to meet with me several times to make sure that my catered reception was exactly what I had planned. The catering staff at Emilo's were wonderful and made sure that everything was available to our guest. I would highly recommend Emilo's to anyone their food is outstanding!! 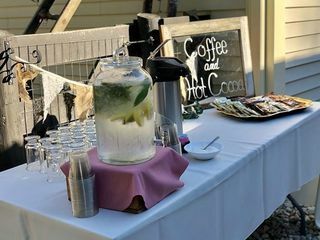 Emelio's catered our daughter’s reception and they went above and beyond to meet all of our expectations!! Annette was very accommodating and her and staff did a wonderful job at our event making sure that everything was perfect. The food was delicious and we had so many compliments, the service was exceptional. Thank you all for making our event a great one. . I highly recommend Emelio’s for any catering needs. Our food was great and our service was great. I honestly cannot say enough great things about Emilio's Catering. Their food was amazing and the people we worked with there were so professional and flexible with what we needed. Even with some last minute changes, they were great. Would definitely recommend! You guys are the best, you made it so fun. Annette, Abby and the entire Emelio's Catering staff went above and beyond to make everything about our day perfect!! Everything was perfectly executed on the day of and we could not have been happier. They responded quickly, were always so pleasant to work with, and made the planning process so easy. They food was delicious and we got TONS of rave reviews from our guests. This was the best decision we made in the wedding planning process!!! We can not thank you enough for the great review and letting us be apart of your special day! Emelio's provided delicious food and the service was above and beyond! Abby was so helpful and responsive throughout the entire process. We can attribute the success of our reception to Emelio's. The entire staff was great to work with, they helped make our special day perfect! Thank you for the great review and for letting us be apart of you big day! It was a pleasure working with the two of you! We used Emelio's for my daughters wedding in October. I can't begin to say how over the top happy we are that we chose Annette and her team. She is super responsive, extremely easy to work with, competitively priced and the food selections were numerous and delicious. We scheduled a food tasting about 15 months before the wedding, and after meeting her and sampling the food, we immediately booked them and felt like the luckiest people in the world having Emelio's for this wedding. Little did we know how unbelievable Annette is to work with. The wedding was two weeks ago and we still can't believe how wonderful everything turned out. She also has multiple contacts and was so helpful sharing names and numbers of people with whom she has worked with. Thank you Annette for making everything look so beautiful and taste so delicious, you were the best to work with! HIRE THEM!!!! They are very good and I intend to use them again. Not only is the food fantastic, Annette DiSabato and Emelio's do everything in their power to fit your needs! We use Emelio's catering every year for our banquet. Prices and food are top notch! Thank you so much for letting us be a part of your big day and for the great review! 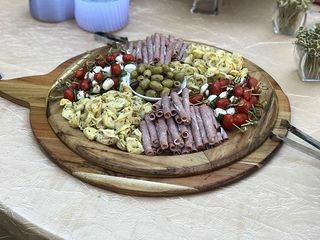 Emelio's did a wonderful job catering our wedding. The staff were wonderful--professional, attentive, and a joy to work with--and the food was great. We heard many compliments from our guests! Working with Emelios staff was so easy! They responded quickly every time we had a question. They were also very professional with all communications and set up several meetings to make sure we were all on the same page! They made the catering part of the wedding planning process the easiest part! I love that they are a small family owned business and treat you like family. They really care about your experience! Last but not least all the guests at the wedding loved the food, especially their special salad! I would recommend them to anyone and my family and I will continue to visit their restruant for their amazing food and great service! We used Emilio's for a luncheon. They were on time and very professional. The food was great, received lots of compliments. I wouldn't hesitate to use them again. I highly recommend the Special Salad. Very nice job and were able to make changes in a very short time due to some additional food that was needed. Everything tasted great and worry free.